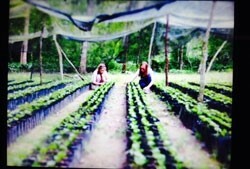 With the finest coffee growers around, two communities helping each other through one link, one livelihood, one coffee. Cafe Paramo is a unique project and business, through which Heathfield Community School is proud to have developed some close and lasting relationships with the Caxarumi co-operative, Ecuador, The Valdesia Region, Dominican Republic and most recently we are in the process of starting a new link with the Sol and CAFE Cooperative, Peru, which is located in the region of Cajamarca. Students at Heathfield Community School are given the opportunity to be part of this amazing business. The students apply and then are interviewed for posts in the following areas: Managing directors, Finance team, Sales / Marketing team, Design team and International Links co-ordinators. 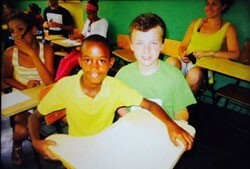 The students run the business and can seek advice from assigned teachers and business mentors. "Café Paramo has allowed me to start my career early. I now know how to sell, be part of/run a business and I have gained some real life knowledge of the coffee industry. This summer I intend to do a work experience placement with a coffee importing/exporting company in London." Students at Heathfield Community School have produced all of the labels for the coffee, and the art work you see is all their own work. They also market the products and sell them via a number of outlets, retailing enough to have been able to develop the second co-operative link. The Cafe Paramo team have presented their story at a number of educational seminars inspiring schools across the country. Proceeds from every packet of coffee sold go directly to the farmers and the local schools attended by their children, helping to buy basics such as tables, chairs, books and pens. Therefore parents of the children are receiving a fair price for their coffee and as a result the children are receiving an education. This all means that you can enjoy the rich, mellow taste of this delicious coffee whilst knowing you are making a difference to a coffee grower and their family's future. Over the last term, the Café Paramo team have been very busy establishing a new Café Paramo team, finding new staff links and learning all about the new co-operative in Peru. We have had stalls set up at multiple sales events; some of which include the year seven and eight Parents’ evenings, Willows and Wetlands Centre and the carol concert. All of these events have been a great success and have resulted in over £1000 of sales and have promoted our business even further. In the summer of 2015 a handful of students headed out to a small community in the Dominican Republic where our coffee is grown. To fundraise for this once in a lifetime trip they packed bags in Sainsburys, sold tickets to win a Christmas hamper and made donation pots that they took to all their sales events. Altogether they raised over £450 in 1 term, but they continued to fundraise though out the year. Eventually July 2015 came around and the students set off on a trip of a life time! We're becoming accustomed to Caribbean life. It moves at a leisurely pace; the heat takes care of that. However, our time here is passing, all too quickly. It's not helped by our inability to shake European habits. We've been busy! Since we last wrote we've; visited two schools, taught English to over a hundred Dominican pupils, drunk from coconuts, had a tour of Santa Domingo and (most poignantly) spent three days at the Dominica orphanage. We were greeted there with smiles, applause, and hugs- indescribably moving. We were nominally here to decorate two classrooms, but we left having done so much more. We've shared food with people who have nothing. We've shared conversations with people who have no English, matched by our lack of Spanish. We've shared the overwhelming passion and power of music. We've witnessed tiny orphans bellowing their thanks for freedom and for the food they were about to receive. The words inspiring, moving and emotional are all overused. In this case, they are more than justified. "Time flies when you're having fun". Never has the proverbial adage been so true. 11 days have raced past. We've seen many places, met many people and learnt about a different culture. Through that, we’ve learnt about ourselves. 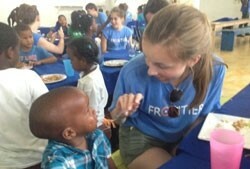 We'll return with our eyes and hearts opened to the people of the Dominican Republic. Highlights? It is impossible to pick out a moment in time. What you can do is try to articulate the spirit that has been woven throughout everything we've done. 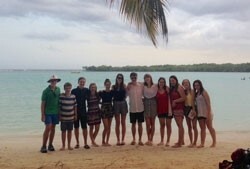 Dominican's have welcomed us with flamboyance and affection. 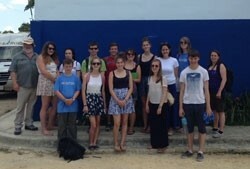 Heathfield pupils have embraced the Dominican's (often literally) and have made their teachers hugely proud. We leave the Caribbean tired, happy, having made new friends and with a treasure trove of memories that will last a lifetime.